Before there was Friday the 13th or Halloween, the same year that Deranged and Black Friday were released, yet another early slasher flick was born: Silent Night, Bloody Night. What was going on in 1974 that spawned two very dark Christmas stories virtually simultaneously? Perhaps those Groovy 70's held their dark secrets after all, hidden beneath layers of polyester and bad hair styles! 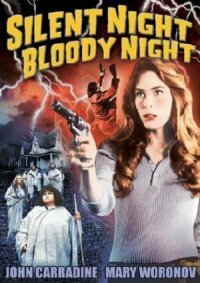 Silent Night, Bloody Night is a somewhat forgotten gem. It doesn't have near the production values as Black Christmas. It's a bit slow paced at times. However, there is a lot that is good about this film and almost great. First we have the serial killer cam, that follows the killer through the house as he stalks his prey. Second, we have the element of surprise as the slow pace of the film lulls us into a false sense of security which is jarred by a sudden swing of an axe or shovel. Third, the movie keeps us guessing who the killer is and we don't really learn the whole story until the end of the film. Fourth, the soundtrack is good with Silent Night devolving into a haunting minor scale that suggests that not all is twinkling lights and holly in this film. Fifth, the director chooses a "less is more" approach in terms of gore. There's not a lot of blood on screen but your mind fills in all the messy details perfectly. Finally, can there really be too many Christmas horror stories? I think not! It's a stressful, scary holiday to say the least. The cast of Silent Night, Bloody Night is mostly unknown to me except for Patrick O'Neal who starred in tons of films including The Stepford Wives and The Way We Were. [There is also a small cameo by John Carradine as well.] Yet, in spite of its lack of star power the cast is quite good and gets the job done rather well. You can download this one for free from Archive.org. However, the copy is rather grainy. Still this actually adds to the enjoyment of the film. I don't think there's a better copy out there. I searched the internet and one is just as bad as the other. If anyone else knows of a better print, please let me know. If you like slasher flicks, then definitely put this one on your list. Silent Night, Bloody Night is a Christmas present that's the perfect gift any time of the year.